In his first investment outlook of the year, Gross called out Fed chief Ben Bernanke for his 2002 "helicopter speech," in which he noted that the U.S. government has the ability to print as many U.S. dollars it wants "at essentially no cost." Gross pointed out that Bernanke never actually defined what "no cost" meant. No matter how you slice it, Gross, who runs the world's largest bond fund, questioned how any central bank can print trillions and trillions of electronic dollars with out any consequence. "They just make it up," he wrote. "Supposedly they own a few billion dollars of 'gold certificate' that represent a fairytale claim on Ft. Knox's secret stash, but there's nothing there but trust." Trust should be something that's earned and not just a foregone conclusion, but that's what appears to have happened, according to Gross. "$54 trillion of credit in the U.S. financial system based upon trusting a central bank with nothing in the vault to back it up. Amazing!," he noted. Gross also took to Twitter Wednesday to express his dissatisfaction with the fiscal cliff deal. Gross added that unlimited check writing, a la QE ad infinitum, will come at a cost. "The future price tag of printing six trillion dollars' worth of checks comes in the form of inflation," he said, adding that "to date, central banks have been willing to accept that cost -- nay -- have even encouraged it." Which brings him to his final piece of advice for investors. Stay away from long-term bonds. "While they are not likely to breathe fire in 2013, the inflationary dragons lurk in the "out" years towards which long-term bond yields are measured," he said. "You should avoid them and confine your maturities and bond durations to short/intermediate targets supported by Fed policies." 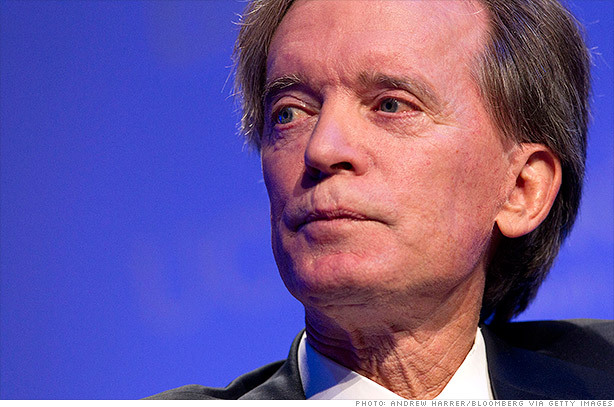 Pimco's Total Return Fund (PTTRX) has been placing its Treasury bets in that spot for months.